There is an artificial divide among us, oh my brewthren, fueled by half-truths and slander: the followers of the delicate ancient glass, and the believers in better buoyant plastics. Though loyalty to one or another is honorable, I aim to strike the middle ground, to set off a black hole of unity amongst all who pursue the fermentation arts. The vessels which hold and protect our malted masterpieces only want to help us achieve great heights of art and flavor. Let us lay out the advantages of each strong-sided vessel, to mutually achieve better understanding. Very easy to clean - abrasive cleaning techniques with brushes, rags on sticks, and every other method under the sun will very rarely damage glass carboys. Readily available - since they've been around for quite a while, these behemoths of bulk are easy to find, either new or used. Oxygen impermeable - glass is solid as can be, and will be highly protective from oxygen as long as it is well-sealed. Lightweight - 1 gallon of water weighs 8 pounds. Therefore, a batch of beer weighs at least 40 pounds. A plastic carboy does not add a significant amount of heft to that initial weight. Unbreakable - Just like Alicia Keys, plastic carboys will not shatter or otherwise become unusable due to an accident. They may dent, but certainly will not explode into a shower of pieces. Hydrophobic - PET plastic carboys actually repel water and other liquids, so staining, flavor leaching, and cleaning are but fringe issues. Often a simple oxygenating cleaner, diluted properly, will clean any sediment from a plastic carboy with adequate contact time. Truly, better living through chemistry. 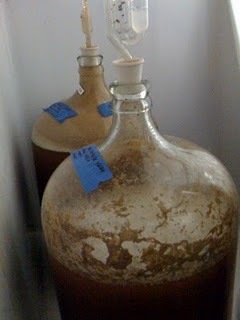 Realistically, both types of carboys will serve any homebrewer very well. Please, consider the virtues of the other side, and help to build a constructive environment, rather than a slanderous snarky scenario.